The voices nominating the 2018 Crystal Apple Awardees included students, parents, fellow staff and administrators. People from all around the Klamath County School District sent words of praise, appreciation and thanks for the five teachers and three classified staff who personify the highest examples of what it is to be an educator. “She has made our son feel safe, valued, respected and loved at school, which is a gift we could never repay,” said, Christy VanRooyen, the mother of one of Deb Cornelison’s students at Keno Elementary. “She is always selfless and doesn’t accept failure. She wants every student to succeed in all aspects of life, even if they’re not in her class,” Macy Hullman, Henley High student, said of science teacher Carly Fullerton. The Klamath County School District is proud to showcase the amazing work these teachers, staff and all-around educators do for children in this community. 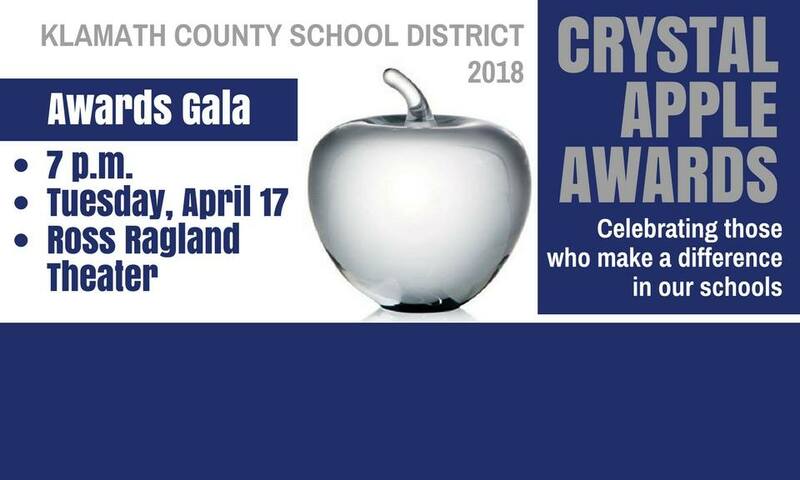 The Crystal Apple Awards Gala will begin at 7 p.m. on April 17 at the Ross Ragland Theater. Staff, their families and special guests are welcome to come celebrate the good work of the entire district. The Klamath County School District Honor Choir will be performing at this event as well. Below are profiles of the 2018 Klamath County School District Crystal Apple awardees. Special Education Teacher Keno Elementary. 7 Years with KCSD. Special Education Teacher Deb Cornelison was nominated for the Crystal Apple Award by her principal, Sarah Shively, but more importantly, a student nominated her as well. Cornelison, 58, is in her seventh year teaching special education at Keno Elementary. Before that she was a paraprofessional with the Klamath Falls City Schools, and a teacher with that district. At Keno she teaches a variety of students with a variety of needs, including social skills, sensory issues, reading and math. Students come in and out of her class getting the help they need. Cornelison is also the interventionist for Keno, and works with PBIS. Shively said Cornelison is at all school events, just there to help. She commends Cornelison on her ability to build students up and celebrate their accomplishments. Cornelison said she loves celebrating her students, every day. Henley High School science teacher Carly Fullerton received five nominations for this year’s Crystal Apple Award. Fullerton, 35, teaches anatomy (a dual-credit with Oregon Tech), biology, integrated science and scientific investigations. In scientific investigations, students pursue their own STEM projects. One of those projects led to Hunger Not Impossible, a program where hungry students can sign up to get meals during the summer. It also grew into the Henley Food Pantry. In addition to helping with those projects, Fullerton assists with Key Club and student council. Fullerton has spent 12 years in education, first as a child development specialist and then as a science teacher. She has been at Henley High for seven years. Cathy Nevala has spent 18 years teaching art at Mazama High School. This is her 26th year of teaching, having previously taught in Helena, Montana. Over the years Nevala has taken pride in watching her students grow. Nevala, 51, teaches sculpture and two-dimensional art. In the past she has also taught photography and desktop publishing. Outside the classroom she teaches summer art camps at Mazama and leads her advanced art students to teach elementary students. She and her students also host Viking Art Night, where they teach the community. Nevala also participates in art shows, and is a member of the Klamath Art Association and a former member of the Oregon Art Association. Aleasha Tacchini keeps focused on her students’ future during the crucial years of middle school. Tacchini, 43, is in her fourth year teaching at Henley Middle School and this is her 11th year teaching. She previously taught at Peterson Elementary, Klamath Basin Behavioral Health and worked in the Klamath Falls City Schools. Special education has always been her focus. At Henley Middle School students attend Tacchini’s class like other periods in the day, attending the classes they need. She teaches seventh and eighth grade math, two English classes and study skills. She also trains staff in crisis prevention and is an English language arts coach for special education in the district. When training new teachers, the KCSD often sends them to watch Stacy Wright in her third grade class at Shasta Elementary. Wright, 45, has taught at Shasta for nine years. She has been a teacher for 19 years, starting her first year at Ferguson Elementary, then going to a small K-12 school in her home town in Nevada, before returning to Klamath Falls to teach at Shasta. She said she enjoys teaching many different students over the years, and working with a team at Shasta. In addition to teaching her students and running her classroom, Wright is on the English language arts team and creates exit tickets for instruction. She also helps newer teachers in the reading program. Outside the classroom she helps with the Mazama High School booster clubs, where her children participate in sports. After 21 years in the classroom, Tess Gonzales is enjoying helping the second generation of students in her career at Ferguson Elementary School. Gonzales serves her students in a number of ways. She works with small groups of students in the special education classroom, focusing on reading and math. She also helps with recess duty and works in the cafeteria. And she completes secretarial work to help teachers stay caught up. Jen Johnson’s library at Lost River Jr./Sr. High School is filled with inspirational words and posters, comfortable furniture and a welcoming atmosphere inviting students to get work done, or just come to read. 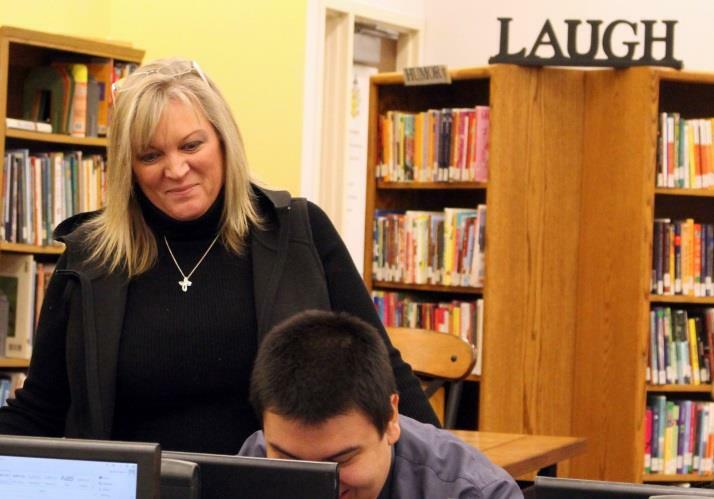 Johnson, 48, has spent her entire 23 years in education at Lost River, where she impacts students in a number of ways. In addition to her job as librarian, she runs the ASPIRE program, and is advisor leadership, Leo’s Club and Prom. She assists with the South County Superstars and Tri School Carnival events. In 2017, as part of her ASPIRE work, Johnson planned the first ever Signing Day at Lost River. The school and community celebrated 34 students as they signed onto their futures, whether it be for a two-year college, university or military service. Students appreciate all that Johnson does for them. In all, 29 students gave testimonials praising Johnson on the nomination form Spark-Stahl submitted. Outside the school, Johnson is a member of the Rural Tourism Basin Revitalization group, which promotes tourism in Merrill, Malin, Tulelake and Dorris. She is also an active member of the Malin Baptist Church, where she is seasonal decorator. When students first arrive at Merrill Elementary, and when parents or community members come to visit, the person greeting them is secretary Terry Robinette. Robinette, 54, said her No. 1 role is communicator. She communicates between teachers and principals, students and principals, the school and home. In running Merrill’s front office, she wears many hats, including nurse, bookkeeper, security guard, friend, and second mom. Over her 19 years as secretary, she has helped with the Merrill PPA and helped with athletics at Lost River when her children were in high school. She said she loves being a part of the Merrill Elementary community. 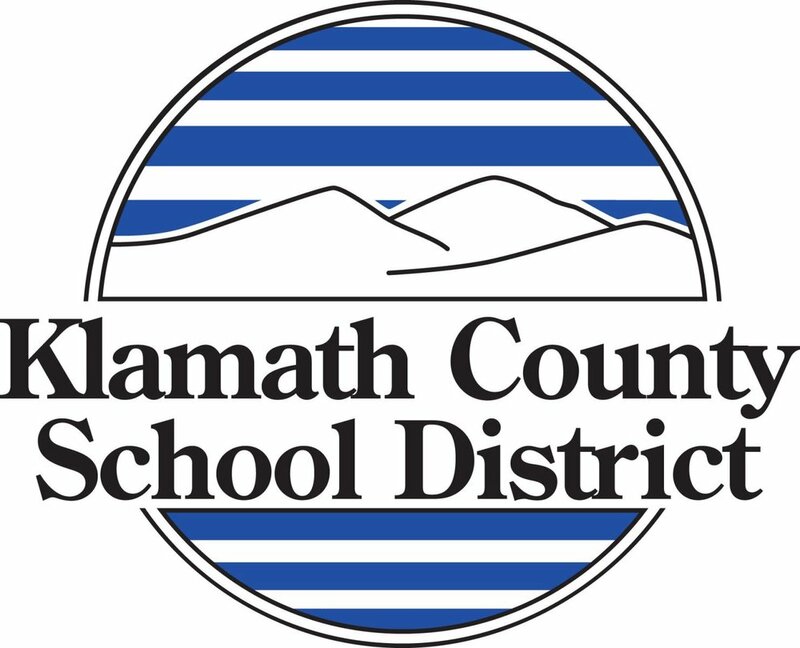 Press release provided from Samantha Tippler, Public Relations, Klamath County School District.